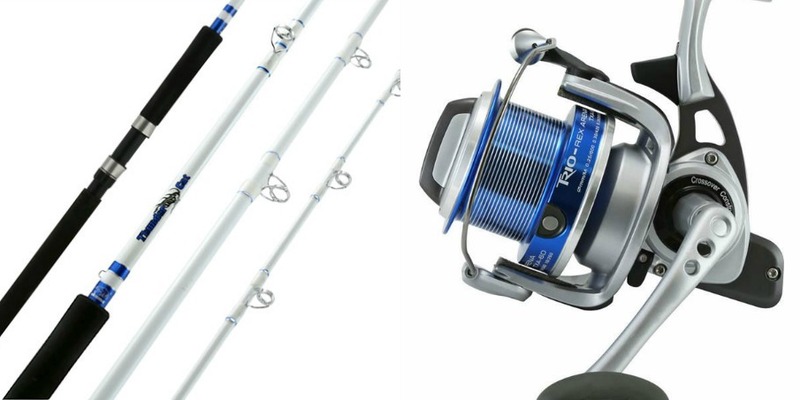 All-new Okuma Azores spinning reels, the Z-55S, Z-65S and Z-80S, are the results of a multi-year engineering review that achieves new levels of strength and stability. 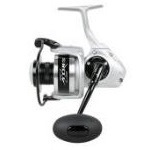 Azores begin with proven power features including die-cast aluminum body, side plate and rotor, machine cut pinion gear and the Okuma Dual Force Drag system that churns out up to 44-pounds of max drag. But it’s within the interior that Azores gains massive separation from competitors. Dual anti-reverse systems, oversized stainless steel spool shaft and a massive forged spool shaft sleeve deliver incredible strength while a 3-piece Mechanical Stabilization System stops electrolysis in its tracks. 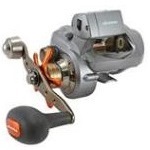 It’s quite possibly the most significant salmon fishing reel ever introduced, while adding exceptional function to musky and striper anglers as well. 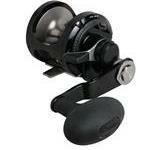 The Cold Water 350 Low-Profile Line Counter brings together three core features to create the ultimate reel. First is a compact ergonomic body that fits the hand with exceptional comfort while housing s high-capacity 350 size spool. Second is a powerful drag system with 25-pounds of max drag output. And third is a precision line-counter for exact trolling presentations. Casting, jigging, trolling, back-bouncing, float fishing, the Cold Water 350 Low-Profile Line counter is one reel that can do it all. Available in both right and left hand retrieve. 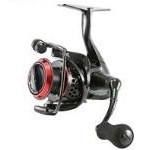 In Okuma’s tradition of creating gear that creates a desire to go fishing, the all-new Caymus spinning reel delivers stunning engineering at an MSRP beginning at $49.99. With its ultra-lightweight, aggressively ported spool and rotor and black and red styling, Caymus makes a statement on the water. Backing up the fierce look is a core of excellence: 8-bearing system including Quick-Set anti-reverse, machined aluminum spool, Blade Body Design, forged aluminum handle, EVA handle knobs and a up to 18-pounds of max drag. Available in sizes C-30, C-40 and C-55, Caymus takes on all mid- to heavy-duty freshwater applications. In the hand, new Cerros takes a deep seat in the palm. The left side plate is 3mm narrower than any previous Okuma design, bringing the angler’s grip more in line with the rod and offering increased confidence overall. The machined aluminum frame serves as a powerful foundation for the hand while EVA knobs greet the cranking hand with cushioned comfort. Nine bearings plus Quick-Set anti-reverse bearing set free enhanced casting distance from the machined aluminum spool and ultra-smooth cranking while delivering authoritative hooksets. Anglers will appreciate a full 24-point magnetic cast control and Cerros’ optional 6.6:1 or 7.3:1 gear ratios. The release of Okuma C-40X long strand carbon fiber framing technology radically enhanced strength while reducing weight , offering a material that is 25% lighter than graphite and 50% stronger. For 2015, Okuma is proud to introduce RTX reel models in larger sizes to include 55, 65 and 80, showcasing how cutting-edge material technology pays huge dividends to anglers. 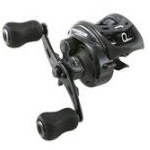 Headlining an extensive feature set of RTX reels is the Okuma C-40X frame and rotor system. Instead of a standard resin featuring powdered filler for strength, C-40X resin is mixed with strands of carbon fiber that overlap and interweave tens of thousands of times. By greatly enhancing the connections between the fibers, strength is increased by 50% over graphite frames. And because less resin is necessary overall, weight is reduced by 25 percent. The introduction of Battle Cat rods offered the serious trophy catfish angler professional level rods with immense inherent power, premium high-durability components and custom rodmaker craftsmanship. For 2015, Battle Cat casting rods are joined by three new spinning models, delivering step-above performance to those who prefer spinning reels. 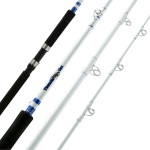 The three new models include the BC-S-762H, BC-S-802H and the BC-1002H at 7’6, 8’ and 10’ in length. Each rod is two-piece for easy travel and rated for casting 1- to 8-ounces of casting weight and 15- to 60-pound line. True giants of the catfish world don’t often live right out in front of the pretty beach or community dock. To get at them takes dedication. To get them out of their environment takes a healthy dose of pure power. In 2014 Okuma Fishing Tackle introduced the elite Battle Cat series of catfish rods for anglers who demand the very best in their equipment. For 2015, new Thunder Cat rods utilize the exact same rod blanks, outfitted with more modest components to make raw power and performance accessible to all anglers. 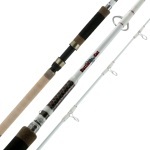 Thunder Cat rods include heavy action 7’6” and 8’ rod length, available in casting or spinning models. In the warmer waters of the Gulf Coast, about every fish that swims is pound-for-pound more powerful and simply just meaner than those that reside in cooler water environments found in the rest of the United States. Standard rod designs may be outstanding in many regions, only to be left in a pile of rubble by an angry redfish or marauding jack. New Okuma Shadow Stalker Gulf Coast rods deliver the action and sensitivity required in the fishery, along with OC-9 carbon reinforcement for amazing strength. 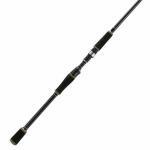 Shadow Stalker Gulf Coast rods include 12 models from 7’ to 7’10” in length. Greater casting distance equals greater available target water. The all-new Okuma Trio- Rex Arena delivers a total commitment to distance, constructed upon a foundation of strength. 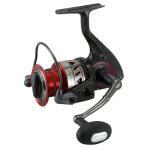 The Trio Rex Arena TXA-60 spinning reel is a size 60 featuring a shallow, large diameter long-cast spool design. With a capacity of 340 –yards of 14-pound monofilament, the reel carries an expansive amount of 30-, 50- or 65-pound braid. 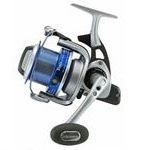 It’s been five years now since Okuma Makaira and Andros reel technology radically advanced big game fishing reel performance. For 2015, key concepts of these industry-leading platforms take shape in all-new Metaloid saltwater reels, radically advancing power and performance available to everyday anglers. Metaliod includes three sizes, a M-5SN (narrow), M-5S and M-12S, each available in single speed as well as 2-speed design. These six reels cover the range from vertical jigging to live bait, casting to light trolling for species up to sailfish and yellowfin tuna.